Different lighting design programs work with different photometric file formats. EULUMDAT is popular in Europe, IES is widely used in the USA. Utilities exist for converting EULUMDAT to IES, mostly for further use in Radiance or Radiance based ray tracers. On such utility is the DOS program EULUMCNV.EXE. No free conversion utilities exist for converting IES to EULUMDAT, but is an option present in Eulumdat Tools. Download and install Eulumdat Tools for your platform, register for an Evaluation License. 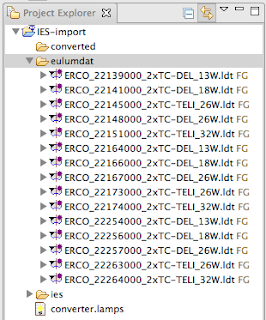 For this demonstration we are going to use a set of IES files from the ERCO site. We use the CL Downlights recessed luminaires for this range. 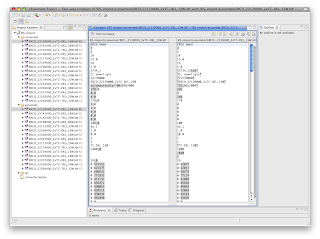 We also download the EULUMDAT files for the same range, so we can compare them later. 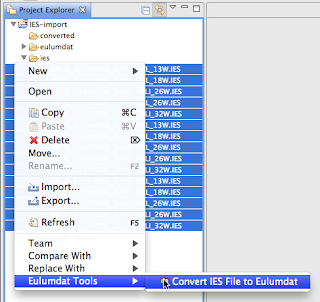 Create a project using New Eulumdat Project and create three folders: ies, eulumdat and converted. 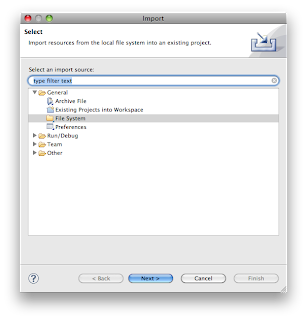 Import the IES files into the folder ies by selecting and right-clicking the Import Wizard. 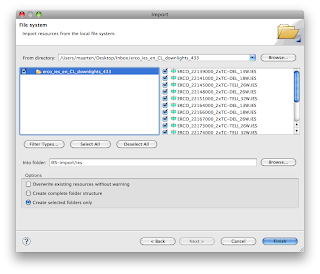 Select the folder with IES files and select all. The result is a set of imported IES files. 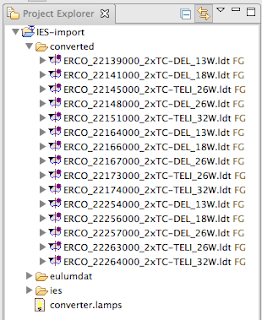 We select the IES files and right-click to use the Convert IES to EULUMDAT option. 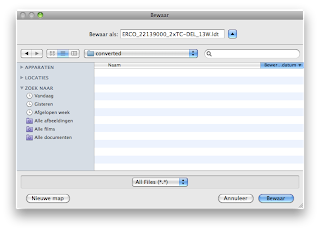 We navigate to the converted folder to save the results. We can change the name, or accept the suggested on for each file. 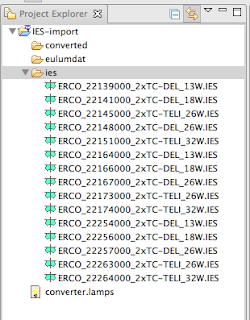 Finally we import the EULUMDAT files the same way to the folder eulumdatfor comparison. 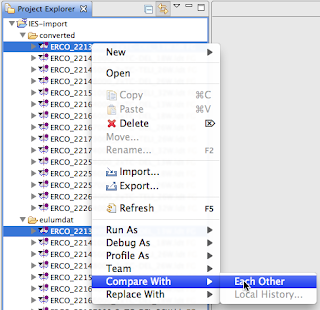 We can select one file in each of the folders and invoke the Compare Editor. We see no difference in the C-Gamma table, only a different set of decimals. There are minimal differences in the Direct Flux Factors. We can manually edit the luminaire dimensions and source type, as these data are not fully included in the IES standard. We can then use the validator and editor to further clean up the EULUMDAT file to make it ready for use or distribution. Eulumdat Tools offers a modern and flexible interface for converting IES files to EULUMDAT. It can convert, ie. use data fields from, IESNA:LM-63-1995, IESNA:LM-63-2001, and IESNA:LM-63-2002 format IES files. It also offers the possibility for manual correction of non-photometric fields, such as brand, product name or product code. "I admire what you have done here. It is good to see your clarity on this important subject can be easily observed. Tremendous post and will look forward to your future update.We start our GATE Coaching Delhi.